California is almost dead last among states in terms of homes built and ready for all the families and individuals that need them. In fact we’re number 49 out of 50 for the number of housing units per capita—only ahead of Utah. From the years 2009 through 2014 the number of households in California grew by 544,000 while the number of housing units grew by 467,000—a major shortfall. Now, the total of new housing being built or being proposed to be built in California is 1 million while the population will have increased by 3.6 million. What this demand/supply shortfall translates into is that half of Californians are being priced out of housing in their markets. According to a New York Times article on California real estate this means that the state’s poorest residents are profoundly affected, having to cut down on medicine and food to make housing payments. And tech workers who make six-figure salaries also can’t afford the rents in certain markets. Another study showed that these high housing costs are affecting California’s economy to the tune of $140 billion being siphoned off into high housing payments. It’s projected that the state will need 3.5 million homes over the next 8 years to meet household demand—more than triple the pace that’s currently underway in construction. Many groups are pushing for vacant lots in Los Angeles and San Francisco to be developed to help meet demand and make it affordable. 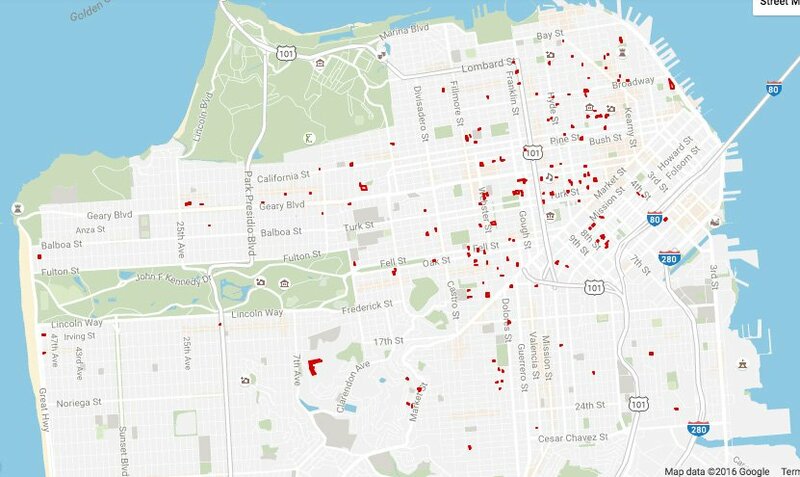 Here’s a convenient interactive map link showing vacant lots in LA and San Francisco.